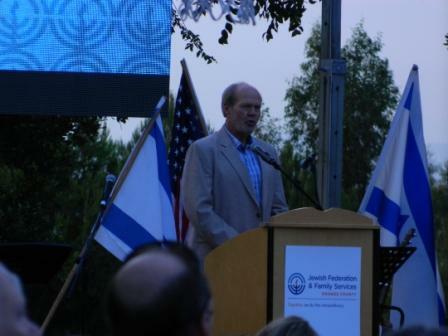 Kicking off the evening was Debbie Margolis, chair of the Board of Jewish Federation & Family Services of Orange County, and Richard Matros, chair of Orange County Council of The American Israel Public Affairs Committee, followed by Pastor Jeff Lasseigne of Harvest Church. 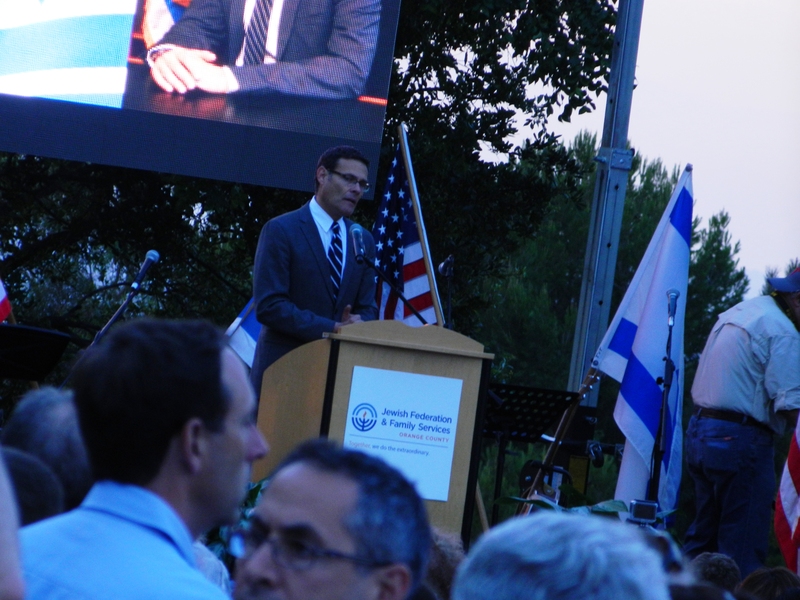 The headline speaker for the evening was David Siegel, the Consul General of Israel in Los Angeles, who gave a solid speech regarding the situation (a video of his speech is available online). Israel is acting on its right to self-defense, which is universally recognized, we’re doing the best that we can under very, very extreme circumstances to protect – literally – our homes and families. And when I say “literally”, think about those thirty-one terror tunnels that have been discovered that were meant to cause mass casualties in Israel, by having terrorists enter Israel in those tunnels, all at once, simultaneously, at some point in the near future. And this operation has exposed that entire operation and we are now actively dismantling it. In these 48 days of trauma, we have recorded almost 3,000 rockets that have been fired at Israel. And these rockets have been fired from Gaza, but also from Lebanon and also from Syria and also from Sinai, effecting every single community in Israel, from the Golan Heights to the Galilee, all the way down to Eilat. This country, the United States of America, would not allow even one rocket to be fired. We didn’t want to be in this situation. Israel has agreed to every cease fire that has been proposed, every humanitarian lull – even Hamas’ lulls – we have agreed to and, guess what? They have violated every single lull and cease fire, even the lull that they, themselves asked for, within an hour. It’s not a situation we wanted to be in: we left the Gaza Strip almost ten years ago – let’s remember that. We left – not to return; we left to enable the Palestinians to have a better future…that didn’t happen. We didn’t want to be in this fight – we have agreed to countless cease fires; we’re willing to engage in cease fires right now; the problem is Hamas continues to fire. And the problem is, as you heard, repeatedly – and this is documented, video-taped – they’re firing from civilian areas in ways that we have seen before, but not at the intensity that we’re seeing right now, from mosques, from hospitals, from private homes…. Iron Dome has been an amazing achievement and we have seen, even tonight, that the skies of Israel are protected all over the country: Jerusalem was fired at tonight – Iron Dome was there; Tel Aviv was fired at tonight – Iron Dome was there; Be’er Sheva was fired at tonight – Iron Dome was there. We will overcome it and Iron Dome is a critical part of this effort. This is not a war with the people of Gaza: Israel has embarked on a very intensive humanitarian effort – we’re sending in almost a thousand trucks in three weeks of humanitarian supplies to Gaza. The audience greatly enjoyed the Consul General’s speech and appreciated the updates. 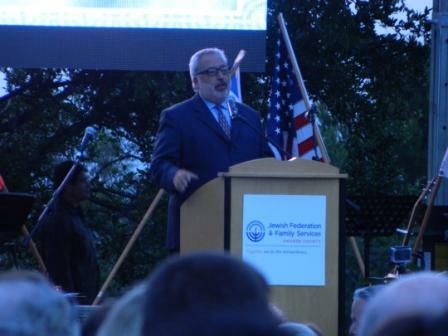 There were also several rabbis who spoke at the rally, including Rabbi Gersh Zylberman, senior rabbi of Temple Bat Yahm and president of the Orange County Board of Rabbis, Rabbi Alter Tenenbaum of Chabad of Irvine, and Rabbi Leah Lewis of Shir Ha-Ma’alot. 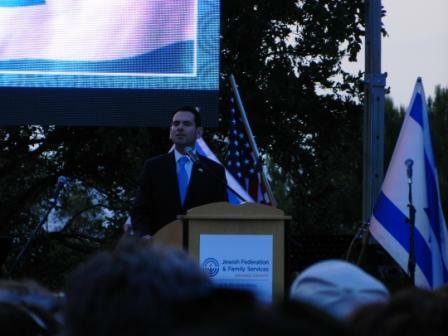 However, it was a rabbi who was not at the rally who stole the show! a remarkable spirit, something strong and vital and an energy in Israel that I haven’t seen since the days of the Six Day War. The country is united and they’re united because they understand one thing: the intentions of Hamas…are the destruction of the State of Israel and to wage a war against the Jewish people. Rabbi Eliezrie flew to Israel (just for 2 days) to deliver 40 iPads, donated by members of his shul, to our soldiers on the front lines. And, boy was he on the front lines. 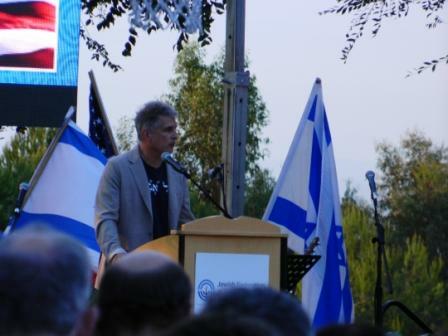 It was surreal—and when the OC crowd was told that the soldiers on screen could hear us, the thousands of us present erupted in a spontaneous roar of support and unity and love that could be heard all the way in Jerusalem! Flags waving, everyone moving on their feet, pouring out their hearts as one heart, as one family, across the globe to a beloved member of our community and his new favorite tank crew. No fear in Rabbi Eliezrie’s eyes. Only the flame of תורה and מצוות. The light of right and goodness. 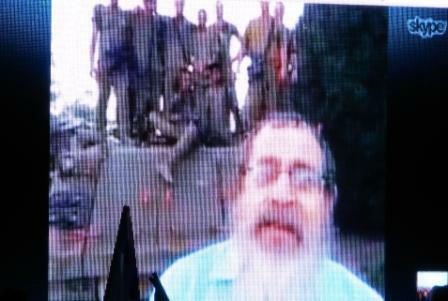 He led us and the tank crew in the שמע ישראל prayer and we all sang עם ישראל חי, עוד אבינו חי, עושה שלום, and דוד מלך ישראל. The emotion and the outpouring of unconditional love and support, the feeling of shared history and destiny, the ONENESS which transcends time and space, was from the kishkes. עם אחד ואמונה אחת: One people, one faith. Truly ONE FAMILY. 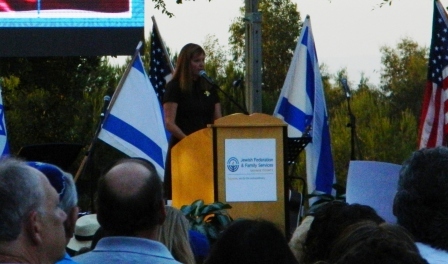 More than 2,000 members of Orange County’s Jewish community and friends of other faiths gathered on Tuesday on the Samueli Jewish Campus to rally for Israel and say no to terror. Representing every Jewish community organization and congregation, we sent a clear and powerful message that Orange County stands united with the people and government of Israel and with the IDF in this time of crisis. For a really nice set of pictures from the evening, you can check out this online album.